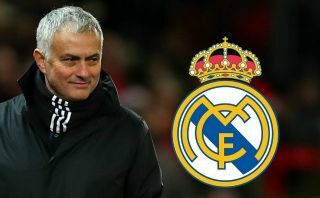 Real Madrid president Florentino Perez is reportedly set to act fast and replace Santiago Solari with Jose Mourinho in the next seven days. Don Balon claim the club will unveil the Portuguese tactician, who was sacked by Manchester United in December, for his second spell in charge at the Bernabeu next week. This is a big decision by Perez, with Mourinho hardly at the top of his game right now after a difficult spell at Old Trafford, which also followed bad endings to his time at Chelsea and his first stint at Real Madrid. However, the Spanish giants look desperate at the moment, with the club now realistically seeing their season end in March after being dumped out of the Champions League and the Copa del Rey in the space of just a few days. Their La Liga defeat to rivals Barcelona also surely ends their slim title hopes as well, so there seems little point in keeping Solari around. Jose Mourinho to Real Madrid after recent Manchester United sacking? Mourinho was not a particularly popular figure at Man Utd, but remains a superbly experienced name and one boasting a CV comparable to that of Solari or his predecessor Julen Lopetegui.